It’s probably not a stretch to assume that most people are familiar with the basic idea of hashtags. But knowing of a concept is certainly not the same as understanding it. As such, it’s important to set the record straight regarding how to use hashtags properly, respective of the platform in which they’re used. From a user standpoint, hashtags are used to categorize content, making the discovery of new or related articles and insights easy to do. Therefore, when hashtags are used incorrectly, people looking for new content have to dig through irrelevant, miscategorized content in order to get to what they’re actually looking for. You don’t want this bad user experience associated with your brand! Categorization aside, when used inappropriately, hashtags can have a negative impact on your engagement. For instance, TrackMaven found that Tweets using more than two hashtags see a significant drop in engagement. The results are similar for Facebook hashtags. However, on Instagram, the story is a little different. 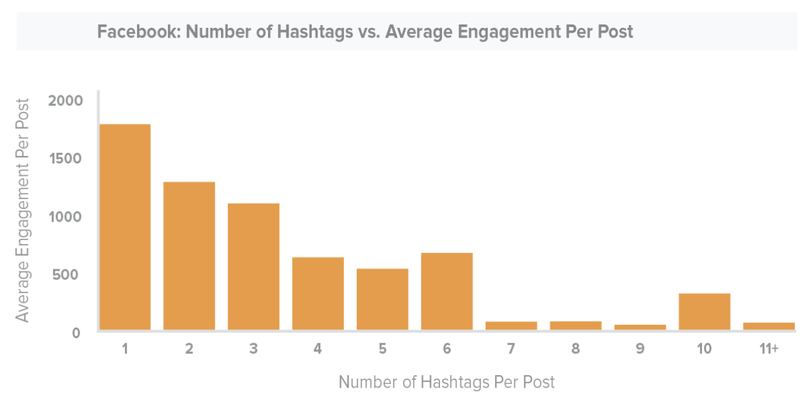 The more hashtags you use, the more engagement you see. However, after about 10 hashtags, you risk losing out on some of that engagement. hash·tag: A word or phrase preceded by a hash mark (#), used within a message to identify a keyword or topic of interest and facilitate a search for it. Whenever a user adds a hashtag to their post, it’s able to be indexed by the social network and becomes searchable/discoverable by other users. Once someone clicks on that hashtag, they’ll be brought to a page that aggregates all of the posts with the same hashtags, in real-time. Once a keyword picks up enough momentum, it becomes “trending.” But trending isn’t always a matter of becoming the most popular hashtag on the networks. Each user’s trending topics are unique, based on their location, social connections and interests. Though each network has its own way of displaying posts under a certain hashtag, and their own algorithms for specifying trending content, these rules tend to hold true in general across each social channel. Where Did Hashtags Come From? The first use of a hashtag in social media can be traced back to one man. Chris Messina is a former Google employee who worked in developer relations and as a designer on Google+. He’s been officially credited as the first person who tweeted using a hashtag. This famous tweet happened back in 2007, so it took awhile for the practice to catch on. As we can clearly see a decade later, hashtags are indisputably here to stay. The word “hashtag” was added to the Oxford dictionary in 2010, and the Scrabble dictionary in 2014, some of the highest authorities on what defines a real word. According to a study by social media agency RadiumOne, almost 75% of people on social media use hashtags. Of course, the number of people who know how to use hashtags correctly is significantly smaller. Using a hashtag on a social post is really as simple as adding the # sign before a single word or phrase, without spaces or punctuation. You can also include numbers in your hashtags as well. Typing out a hashtag is simple enough, but there are some subtle nuances you should learn to get the most out of them. If you’re using hashtags for their intended purpose (categorization and discovery), don’t string too many words together with a single hashtag. On most networks, if you use a hashtag on a public account, anyone who does a search for that hashtag can find your post. Don’t #spam #with #hashtags. Avoid over-tagging a single post or adding them to every word. Tweets with hashtags had 2 times more engagement than those without, and 55% more Retweets. Use hashtags only on Tweets relevant to the topic. Trying to get attention by using a mismatch between the content of your Tweet and hashtag use won’t do you any favors if people are annoyed. While jumping in on trending conversations is recommended, be careful to tread lightly—especially when using a brand account to respond to a disaster. People have mixed feelings in terms of how a company should show their support for disaster victims. As a general rule, whatever you do, don’t use these types of conversations as a blatant sales opportunity. For an added level of timeliness, look through daily trends and our Hashtag Holiday Calendar for conversations to jump on in real time. Just as with incorporating keywords into content to boost search engine rankings, a social media marketer must do hashtag research to optimize their content for the most relevant audience. Hashtagify.me is a free tool you can use to find hashtags. It also gives numeric data on hashtag use and helps you to map a hashtag in relation to other similar options. RiteTag is a powerful hashtag search tool you can use for Facebook and Twitter. It provides up-to-date data as to how your hashtag is performing. 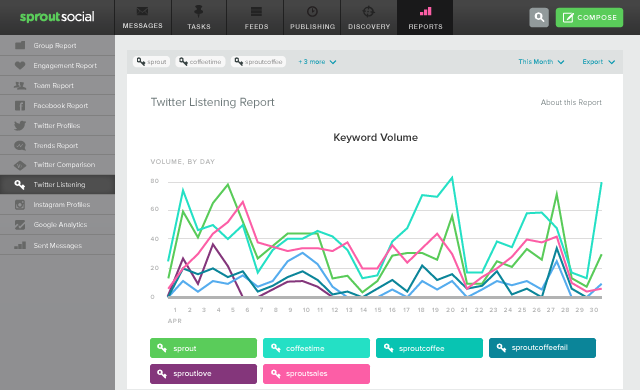 Sprout Social has a hashtag analysis tool that discovered your most engaged and relevant hashtags around your brand. Additionally, our tool can be used as a hashtag finder across networks. Besides these useful tools, there’s a simple low-tech strategy for finding hashtags. Look through similar accounts, see what hashtags they’re using, and click through to see how other accounts are using those hashtags. This is an easy way to find hidden gems that may not show up on searches through the above tools. 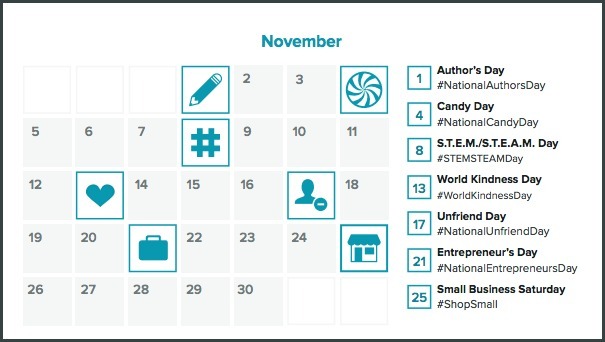 If you take one thing away from this guide on how to use hashtags, let it be this: make your hashtags specific to the audience you’re trying to attract. The more targeted the audience, the more engaged they will be, and the better your content will be received. Besides using popular (and relevant) hashtags, you may eventually decide to create and use a branded hashtag. A branded hashtag is a hashtag you create specifically for your brand. As an example, consider #ImLovinIt for McDonald’s. A branded hashtag does not have to contain your brand name, just represent it in some clear and connected way. A subset of brand hashtags include product hashtags, which are specific to products that belong to the scope of a specific brand. Here’s an example of Samsung using #GalaxyS8 to promote its new phone. There are also campaign specific hashtags, which are created for a specific marketing campaign. The shoe brand Tom’s uses #withoutshoes to coincide with their campaign to raise awareness for children throughout the world that don’t have shoes. Although it’s hard to stop people from incorrectly using your branded hashtags, you can actually trademark your branded hashtags. In order for them to resonate with your audience, branded hashtags must be relevant, memorable and unique. Be careful about being too general. It’s much better to get as specific as possible, even if it feels like you’ll have less reach. For example, a brand targeting new parents might not want to just use the hashtag #parent, because it’s very broad. Instead, the brand would be better off using the hashtag #newmom, which more accurately targets their intended audience. On a serious note, when creating your own hashtags, spelling is important. For example, you might read the hashtag for Susan Boyle’s album launch party, #susanalbumparty as something much different than what was intended. Even just capitalizing the first letter of each word can help to differentiate the individual words in a hashtag, and can help you to avoid a PR disaster. Most social networks started using hashtags after Twitter first accepted their use, and each social network uses them differently. These rules can help keep you honest relative to the platforms you’re using for your company’s social media strategy. On Twitter, hashtags are used to find conversations to get involved in, or to start one of your own. As long as your profile is public, people can find the posts in which you make use of hashtags. As we mentioned earlier, Tweets with one hashtag generate the most engagement. But engagement drops when you use more than two hashtags. This may be because people assume too many hashtags indicates foul play by bots (or desperation, as discussed earlier). You can find hashtags on Twitter by using the search bar, clicking on the hashtag or looking through the trending topics page. An Instagram hashtag collates all photos with the same hashtag into one stream. The purpose of hashtags for Instagram revolves around discovering content and finding users to follow, exposing you to a larger audience. One study found that posts with at least one hashtag have 12.6% more engagement than those without. You can discover hashtags by searching for a specific term or clicking on one in a post. When you land on a hashtag page, you’ll see all the photos with the same hashtag and even see some related hashtags you can use. Start typing the hashtag with the “#” symbol, and Instagram will give you suggestions based on popularity. 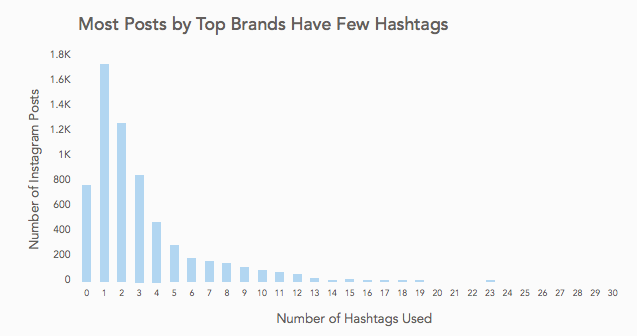 There have been multiple studies on the optimal number of hashtags to use on Instagram. Since the results tend to vary, there is no universally agreed upon number. We recommend testing it out to see what gets the best results with your audience. Just keep in mind Instagram limits hashtags to 30 per caption or comment. Unlike Twitter or Instagram where most users’ profiles are public, Facebook users have private profiles. Thus, the hashtags most people use on their posts are not discoverable to the public and are therefore limited to the people they know. Because of this, most public hashtags belong to influencers or brands. Search using the search bar. Hashtags on Facebook previously were not recognized, but now they are. 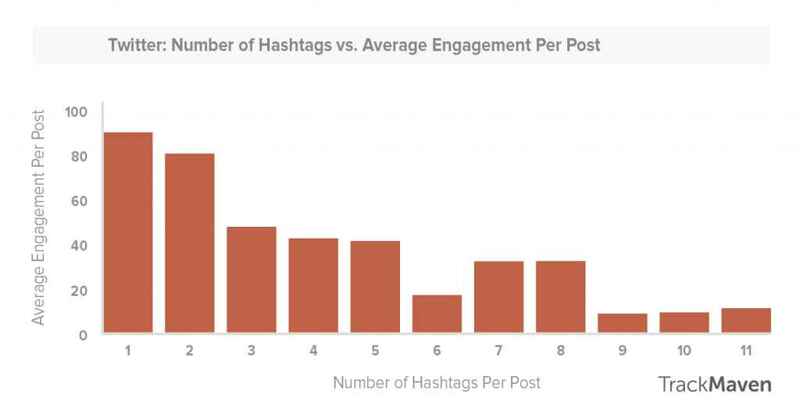 If you use hashtags on Facebook, keep it to 1-2 hashtags per post per the study we mentioned earlier. 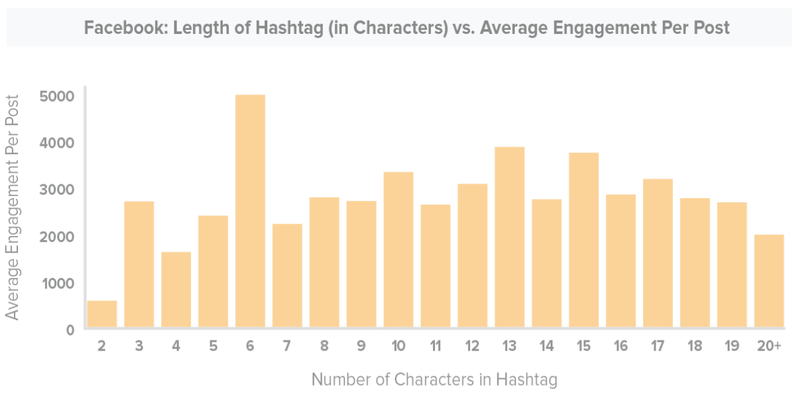 It’s also worth noting that hashtags with 10+ characters receive good engagement. LinkedIn is one of the latest major social networks to experiment with hashtags. As of this writing, they only work on mobile (in terms of linking to related content), and as such, look a bit strange on desktop. When you’re creating a post on your Tumblr page, you’ll see an area at the bottom asking you to add “tags.” When you start to type a tag for your post, Tumblr will automatically add a hashtag to the front of it. The main thing that you need to bear in mind when creating hashtags on Pinterest is that they’re only clickable in a Pin description. Also, hashtags aren’t searchable on Pinterest, so you’ll need to just search the keyword to find the content. Hashtag use within YouTube is most prevalent in the comments section. Users can leave comments with hashtags, which will then click through to a page with videos that contain that hashtag in their title. However, it’s perhaps more important to implement a keyword strategy since hashtags are not widely adopted by users yet. On Kickstarter, sorting by different hashtags can make it easier for you to find projects that peak your interest or plans for investment. When determining how to use hashtags, make sure to do some platform-specific research to determine if a hashtag strategy is even appropriate. When you’re researching hashtags to use to engage with your audience, it’s also beneficial to consider your audience. Find the keywords and hashtags that are already associated with your brand, and adopt the positive ones. With resources like Sprout Social’s Twitter Keyword Report, it’s easy to find out exactly which terms are being associated with your brand most often. Not only are tools like these good for finding new things to tweet about, they’re good for seeing how well your tweets are performing, in general. Easily track Retweets, favorites, social reach and more. The more time you spend analyzing your efforts, the easier they are to improve, and the closer you’ll come to achieving important social media KPIs. How Do You Use Hashtags? Though each network has their own rules and guidelines, understanding the basics of how to use hashtags is an important area of understanding for your social media strategy. Hashtags can help you to communicate with followers, drive engagement for your content, and attract a new audience to your brand. What are your greatest insights for how to use hashtags? Is there an awesome tool or strategy we missed? Tweet your thoughts at @SproutSocial or drop a comment below! Maddy Osman: Maddy Osman creates engaging content with SEO best practices for marketing thought leaders and agencies that have their hands full with clients and projects. Learn more about her process and experience on her website, The Blogsmith, and read her latest articles on Twitter.